As buildings have become tighter, a variety of issues related to roof ventilation—including ice damming, water condensation and mold within the building envelope—have tormented owners and contractors alike with increasing regularity. Many of these issues have manifested as costly court battles and insurance claims resulting in the general public’s heightened awareness of these concerns and increased accountability in the contracting community. Professional roofing contractors have a distinct role to play to ensure ventilation standards are met–primarily at the ridge. The ventilation standard is specified in the 2003 International Residential Code (IRC) Sect. R806. For roof areas over heated or conditioned spaces, a net free ventilation area of 1 square foot per 150 square feet (67 cm² per 1 m²) of ceiling area is required. This can be simplified by rounding the equation to 1 square inch of ventilation per square foot of ceiling. In passive roof ventilation systems, the air flow required is divided evenly between eave vents and ridge vents so convection current naturally pulls cooler air through the soffit vent and exhales warmer air and moisture through the ridge vent. A gable roof forms a triangle with two points of air entry at the soffits and a point of exit at each side of the ridge cap. The net free air (NFA) rating at each of these points should be roughly equal, and when all four are added, they should equal at least the minimum free air required for the heated space below. NFA ratings are measured in square inches of free air per foot run of vent (ridge or eave). On a typical sloped roof on a rectangular, the ridge and eaves follow each other parallel to the ridge in the center of the roof and the eaves at either side. If there are no valleys or hips in the roof system, it is relatively easy to determine what the NFA rating needs to be at these locations. You simply divide the width of the building in feet by four to determine the NFA rating required at each of these four points (W ÷ 4 = NFA). If a building is 24 feet (7 m) wide, you need an NFA rating of six at each eave vent and on each side of the ridge cap to satisfy the ventilation standard (24 ÷ 4 = 6). On buildings with cut-up roof lines, this equation still works as long as the total linear footage of soffit is roughly twice the total linear footage of the ridge. When buildings have much more soffit than ridge (as in the case of hipped buildings), an alternative means will be necessary to vent the peak, such as a cupola or mechanical vent. When there is more ridge than soffit (as in the case of multi-valleyed roofs), creative means for introducing more air at the eaves needs to be explored. 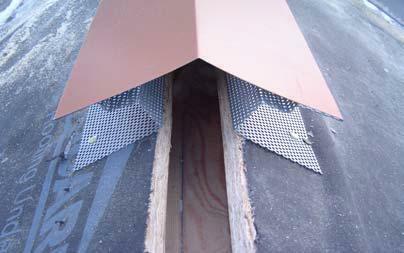 Intake and exhaust vents must be positioned so they provide continuous air flow on the underside of the roof sheathing. In valleyed and hipped roof systems, it is important to position the intake vents so they feed the roof system evenly and exhaust vents so they draw the air evenly from the intake vents across the roof deck. When cathedral ceilings are under hipped or valleyed roofs, it often is necessary to design a ventilation system over the roof frame to obtain proper air flow. The ridge vent system shown in this article is designed for buildings up to 36 feet (11 m) wide with a total NFA rating of 18 (a ridge vent with an NFA rating of 18 has 18 inches (457 mm) NFA per linear foot of ridge vent with an NFA rating of 9 per side). The venting portion of the cap is fabricated from 20-gauge perforated flat sheets with 1/8-inch (3-mm) holes drilled 3/16 of an inch (5 mm) apart. This product has 40 percent of its area open for ventilation. Simple alterations to the measurements of the vent and cap components can increase the NFA rating for wider buildings. We have designed and installed ridge vents for buildings up to 80 feet (24 m) wide with the ridge cap still looking appropriately sized. We have been using this detail for many years in the conditions we face in the upper peninsula of Michigan. On the shores of Lake Superior, it is not uncommon for winds to approach 50 mph, and inland we can experience 300 inches (7620 mm) of snow during a winter season. 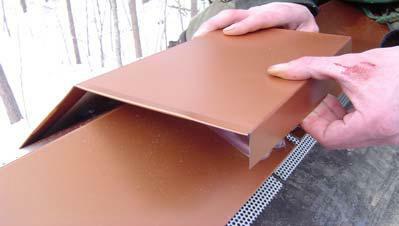 We have not experienced snow and water infiltration using this ridge vent detail on our applications. The use of air baffles at the ridge is particularly important when high-wind conditions are prevalent. When homeowners experience ongoing problems with ice damming or moisture in the attic, the roofing contractor often gets the call. Inadequate insulation and ventilation is often the culprit. It is important to be proactive in addressing these problems before any roof installation. Following are some pictures of the details we have developed to address these issues in our area. 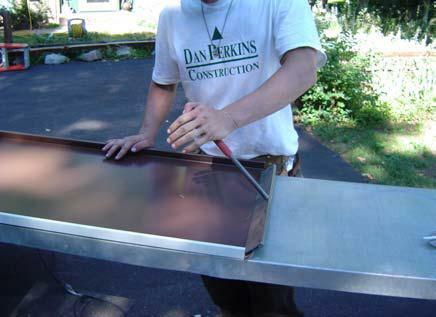 Dan Perkins, a residential and commercial architectural standing seam roofing installer and consultant from Northern Michigan submits these insights on the issues of roof ventilation from an installer’s perspective. 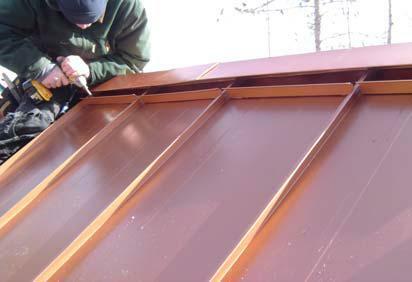 The ridge vent and cap shown are designed to be installed before the roofing panels are installed. This has proved to be a watertight system that can be applied more efficiently and safely than ridge caps that are installed after the panels are installed. 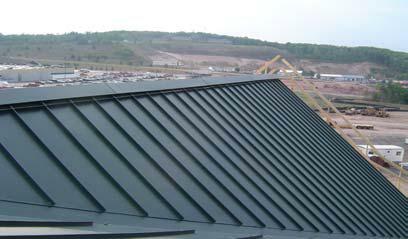 Each 10-foot (3-m) length of vented ridge cap is comprised of two perforated C-channels and a section of cap fabricated from the same coil material and color with which the roofing pans are made. 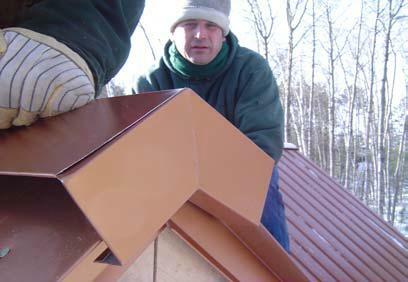 The cap is crimped onto the vented Cchannels on the job before each section of ridge is installed. The ridge is affixed to the roof deck with screws or roof nails through the edge of the perforated stock that extends past the cap on each side. Joiner caps are crimped over the adjoining ridge caps with sealant underneath. It is important to make sure there are no gaps where the ends of the perforated stock meet so there are no entry points for bugs, bats or rodents. The roofing pans are “box panned” before they are installed into the ridge and baffles are applied to prevent wind from driving water and snow directly into the perforations in the Cchannels. As the wind is diverted around the baffles and over the ridge cap, negative air pressure is created, increasing the air flow out of the roof system. The baffles are applied to the roof panels on a 1-inch (25-mm) butyl tape and screwed down with gasketed fasteners. It is important to leave a gap at the sides of the baffles for water to drain from the ridge assembly. The ends of the ridge are closed with an end cap that is slid into the hem holding the cap to the perforated C-channels. 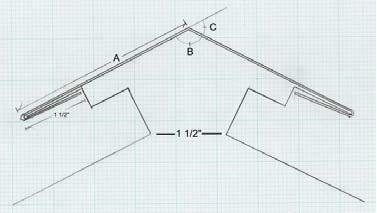 The angles and dimensions of the ridge cap will change with the roof slope. A minimum of 11/2-inch- (38-mm-) wide channel at the peak is necessary between the two perforated Cchannels inside the ridge cap to allow proper air flow. As the roof angle gets steeper, the cap needs to become wider to maintain the width of the air channel. A drawing with values for these measurements for different slopes is shown. This entry was posted in Dan Perkins, Log Building Tips, Techniques. Bookmark the permalink.